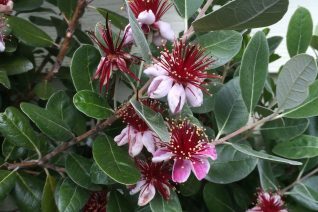 Pineapple Guava is a remarkable evergreen shrub. Hardy in the Maritime PNW and is best used as a specimen in a warm position. To 7′ tall and 5′ wide it produces small but dramatic flowers in summer with bright red stamens and four swollen red petals that when eaten taste like fruity cotton-candy- excellent for children, fruit salads. These edible petals appeal to birds who unwittingly pollinate the flowers when they are noshing on the sweet treats. Handome gray foliage. Full sun, regular soil and water. Occasionally fruits in our climate. The fruits are avacado green and about the size of a fuzzy kiwi. If they ripen by November into December they have a spicy sweet pulp- cherished by many. Becomes much more hardy to cold when established. Good for hot aspects. Prune after flowering. Dynamic, handsome, and fun shrub to grow. High elevations in Brazil- other S. American countries. Drought tolerant when established but regular summer water speeds growth/establishment. Syn. Acca sellowiana.